Kev Taggart and Tim Rogers are stuck in the past. They run the English workshop Spirit Of The Seventies, turning out exquisite resto-mods based on Japanese classics like the Kawasaki Z750 and the Yamaha XS650. The owner had a problem though: he was due to marry, and his wife-to-be insisted that he slowed down a little and stuck to the Queen’s highway. So rather than sell his beloved Triumph, he gave it to Spirit Of The Seventies for a thorough makeover. 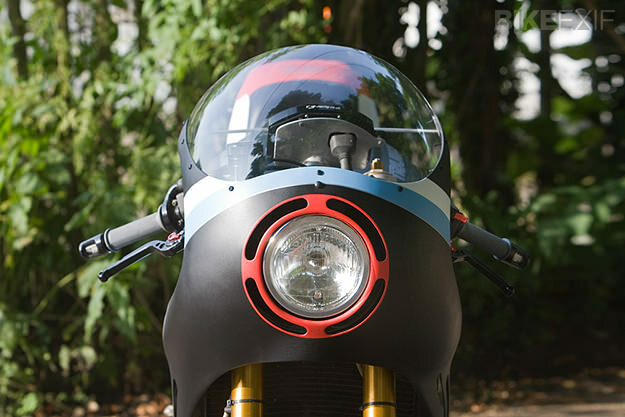 The central air-intake on the original 675 Daytona fairing had to be reconsidered, so a slotted, circular funnel was fashioned around the new headlight. 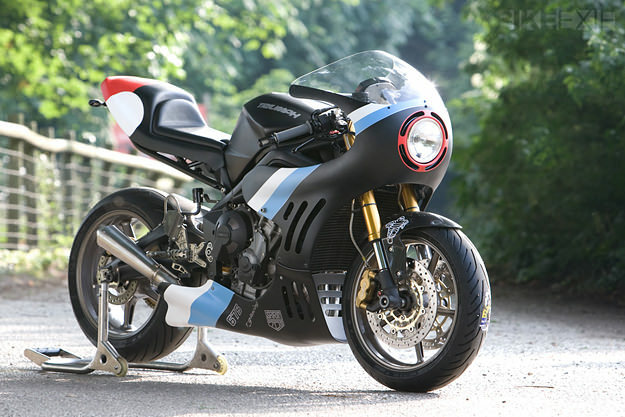 Once the fairing was completed, Skidmarx designed and fitted a one-off screen. A leather seat pad was carved and stitched by Glen Moger, and the bodywork was covered in matt paint by D-Luck’s Paintshop in Brighton. The Triumph was then rewired and fitted with a keyless ignition system from Motogadget. 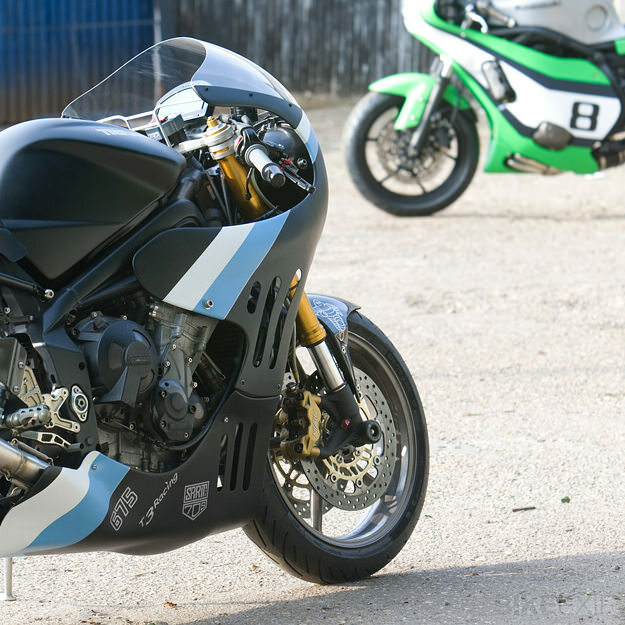 Co-Built welded up a lovely low-level 3-into-1 stainless steel exhaust system, using headers originally made for a racer in the British Supersport series. 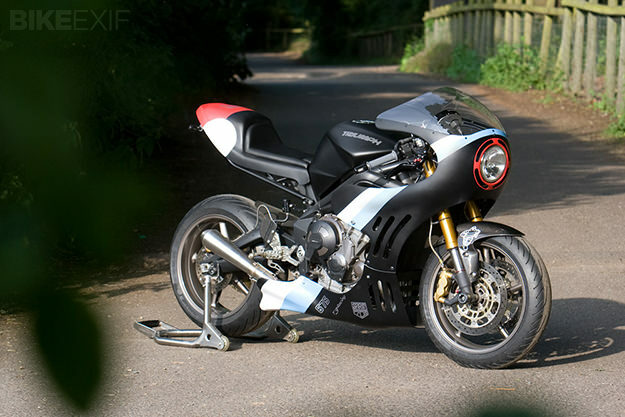 Various other additions such as Oberon bar-end indicators were added, and the bike was serviced and dyno’d before having its super-stiff suspension softened for road use. It should make a hell of a road bike—classic looks with truly modern performance. Images courtesy of Grant Robinson. Check out our coverage of previous Spirit of The Seventies builds here.